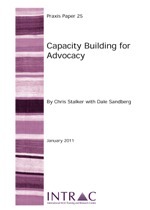 This Praxis Paper looks at current practice, experiences and theory in advocacy capacity building. The paper’s findings are primarily directed at civil society support organisations globally, but the insights are relevant to CSOs, donors, research institutions and individuals from a variety of backgrounds. Driven by the need to find effective solutions to the problems of poverty and injustice, recent thinking about civil society has begun placing a greater emphasis on advocacy. There is a growing expectation that civil society organisations (CSOs) should be conducting advocacy, engaging with and influencing key policies and decision makers to complement the service delivery role of CSOs. To facilitate the shift, considerable effort has been invested in capacity building for advocacy. So, what has been learnt in the process? Advocacy capacity interventions should be considered and planned on multiple, interrelated levels that can sometimes seem confusing and complex. Disentangling these links involves assessing the quality of capacity building support provided, exploring and addressing questions about the extent of an organisation’s receptiveness and understanding, and tracking the external environment and its influences on the organisation. Most importantly, as this paper shows, for a capacity building intervention to be effective, CSSOs must be aware of the complex nature of advocacy and follow a strategic, diagnostic approach.